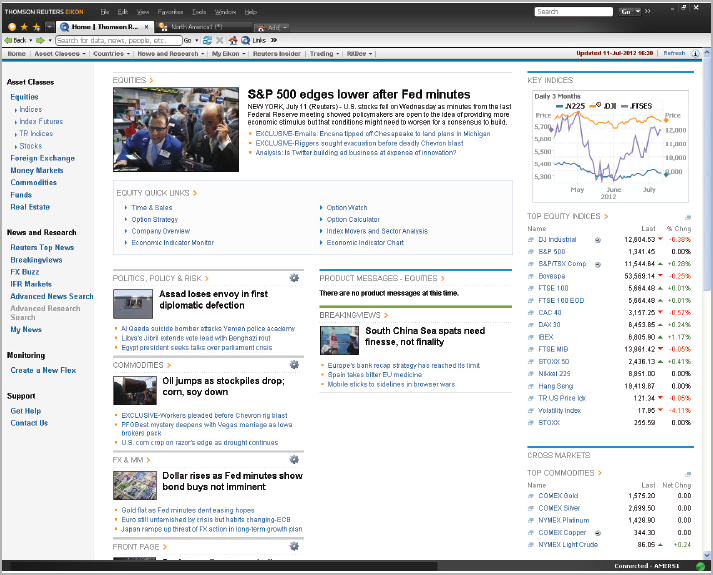 Loaded with real-time news & data, fundamentals, economic reporting, analytics, and much more. Refinitiv XENITH for Retail Traders is quite simply the most powerful platform available to the private trader. Weâ€™ve placed the most comprehensive market information, news, analytics, and fundamentals available in a desktop, and made them as simple to use as the internet. Now you can find the essential news, data, commentary, and analytics you need, all in one place. Search all content in powerful new ways. each result delivers related content, anticipating your next step. With the optional MetaStock Real Time software package, you have the analytic trifecta called the PowerTools. courtesy of FundSoft Information Systems! Loaded with real-time news & data, fundamentals, economic reporting, analytics, and much more, Refinitiv XENITH for Retail Traders is quite simply the most powerful platform available to the private trader. *After 30 days, the account will be charged the monthly fee until cancelled by the customer. - Exchange fees are not included in 30 day trial. - Annual packages yield an estimated 20% savings and are non-refundable. Refinitiv XENITH for Retail Traders search is a high-speed, integrated information and data retrieval service which includes the following search functions. Add the optional MetaStock Real Time software package, and take your technical analysis to a whole new level with the time-tested PowerTools: The Explorer, The Expert Advisor, and the System Tester. "My Economic Monitor" provides a list of all reports sorted by regions and countries. The Regional and Futures data packages contain Global delayed data. Delayed data is typically 20 minutes delayed. To subscribe to a real-time exchange, you must subscribe to the associated data package. See below for the list of exchanges found within each data package. Exchange fees apply to real-time exchange subscriptions. Subscribing to all of the "regional" data packages (American, European, Asian) provides you with all of the data found in the futures and forex packages as well as the opportunity to subscribe to any available real-time exchange. The Forex data package only contains real-time Forex data and cannot be combined with any other data packages, nor are customers able to subscribe to any real-time exchanges. MetaStock Real Time is our real-time product that is powered by Refinitiv XENITH for Retail Traders - without it, your MetaStock Real Time product will not have data. MetaStock is the end of day product that is powered by DataLink data - without it, your MetaStock End of Day product will not have data. What is Refinitiv XENITH for Retail Traders? Refinitiv XENITH for Retail Traders is a software and data module that empowers you with advanced, fully customizable analytical capabilities, and comprehensive cross asset data. If I'm a professional trader, can I use Refinitiv XENITH for Retail Traders? No, Refinitiv XENITH for Retail Traders is only for Non Professionals as defined by the New York Stock Exchange: Nonprofessional Subscriber means any person who is not: (i) registered or qualified with the Securities and Exchange Commission, the Commodities Futures Trading Commission, any state securities agency, any securities exchange or association, or any commodities or futures contract market or association; (ii) engaged as an investment advisor; nor (iii) employed by a bank or other organization exempt from registration under Federal and/or state securities laws to perform functions that would require him or her to be so registered or qualified if he or she were to perform such functions for an organization not so exempt. DataLink is an end-of-day data service that provides the following data fields for a symbol: Date, Open, High, Low, Close, Volume, and Open Interest. The historical data goes back at least 15 years, often times with more. There are many different software programs that are compatible with DataLink using the Downloader program. MetaStock Real Time works with Refinitiv XENITH for Retail Traders. The Refinitiv XENITH data feed gives MetaStock Real Time the highest quality analysis at the best price. MetaStock works with DataLink. The DataLink data feed gives MetaStock the highest quality analysis at the best price. Do I have to use a MetaStock data feed? Yes. All MetaStock products work exclusively with MetaStock data feeds. Do I need to order an add-on or doesMetaStock work on its own? MetaStock needs the DataLink in order to run. MetaStock Real Time requires Refinitiv XENITH for Retail Traders for its data. MetaStock and MetaStock Real Time do not need add-ons to operate. Add-Ons enhance the functionality of MetaStock. Most Add-Ons work for both MetaStock Real Time and MetaStock Daily Charts versions of MetaStock. However, the table below shows what we recommend. What is FXTAâ„¢ - FX Trader's Advantage? FXTA is a subscription based Add-On designed to work with MetaStock Real Time or MetaStock Real Time FX. It includes custom indicators, explorations, system tests, and expert advisors that focus on trading currency pairs. Click here for more info. System requirements are listed on the System Requirements tab above. Officially MetaStock is not supported when installed onto a Mac computer. However, we have several clients using MetaStock on the new Macs with the Intel processor and they have reported that they've encountered minimal issues. While we haven't tested MetaStock on Macs, our discussions with customer using it indicate that for the most stable Mac environment, the Windows operating system must be running through a Mac application called Boot Camp. Similar applications may not work properly (for example Parallels or Virtual Machine). MetaStock software installed on a Mac computer is eligible for the 30-Day Money Back Guarantee. All conditions and requirements apply to Mac users regardless of the timing or nature of potential Mac related issues. MetaStock will make every effort to provide support for running our software on a Mac and help customers troubleshoot issues they encounter; however as we have not officially tested MetaStock in this environment, MetaStock is not unable to guarantee support beyond a reasonable effort. What's New in MetaStock 14? 43 NEW Adaptive Indicators - Provides dynamic "look-back" functionality based on volatility, cycle, or a combination of both. Six NEW RMO Alerts- Six new alerts for the RMO, including buy above high, sell below low, new blue bar, new red bar, entering bullish zone, and entering bearish zone. 2 NEW Stops - Intellistops and Chandelier Stops - both to help your system know when it's time to get out of a trade. To learn more about these and other features, visit the individual Features page for each product. "Officially MetaStock is not supported when installed onto a Mac computer. However, we have several clients using MetaStock on the new Macs with the Intel processor and they have reported that they've encountered minimal issues. While we haven't tested MetaStock on Macs, our discussions with customer using it indicate that for the most stable Mac environment, the Windows operating system must be running through a Mac application called Boot Camp. Similar applications may not work properly (for example Parallels or Virtual Machine). MetaStock software installed on a Mac computer is eligible for the 30-Day Money Back Guarantee. All conditions and requirements apply to Mac users regardless of the timing or nature of potential Mac related issues. MetaStock will make every effort to provide support for running their software on a Mac and help customers troubleshoot issues they encounter; however as we have not officially tested MetaStock in this environment, MetaStock is not unable to guarantee support beyond a reasonable effort." In this brief discussion, Kelly Clement shows you how to do basic charting in Refinitiv XENITH Real-Time News and Data.